Micromax has unveiled its Bharat Go smartphone at the ongoing MWC 2018 event in Barcelona on Tuesday. This will join the league of other Android Oreo Go Edition phones launched at the event including Nokia 1 and Lava Z50. The Micromax Bharat Go will be available in India starting next month and it could be priced around Rs. 2,000. A few days ahead of the MWC 2018 event, Google revealed that it would announce Android Oreo Go Edition smartphones at the tech show. Until now, a few such phones like Nokia 1, and Lava Z50 were unveiled over the past two days. Now, Google seems to have chosen to showcase a new one from Micromax. The Micromax Bharat Go being an Android Oreo Go phone runs Android Oreo Go edition which is a toned-down version of the latest Android OS meant for the entry-level smartphones with 1GB or lesser RAM. If we talk about other specs, the Micromax Bharat Go will come with a 4.5-inch FWVGA LCD display. Under the hood, it is said to be powered by a quad-core MediaTek processor paired with 1GB RAM and 8GB internal storage space. In the camera department, the Micromax Bharat Go smartphone comes with a 5MP selfie camera and a 5MP rear camera. Both the cameras come with LED flash as well. The phone packs a 2,000mAh battery. 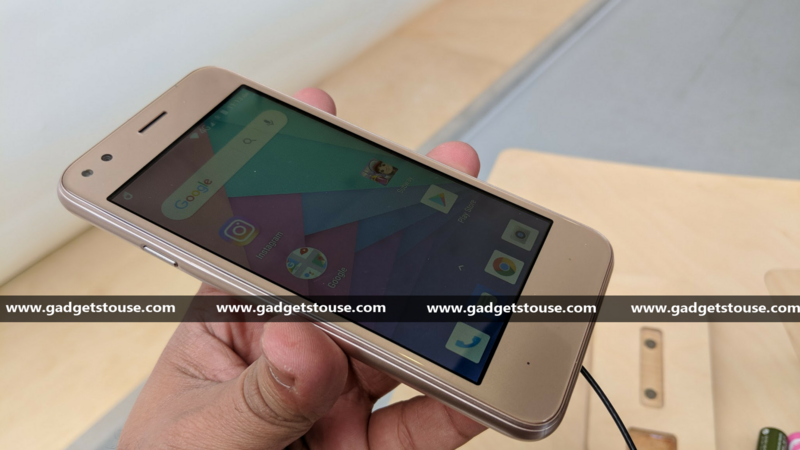 Since it is optimized for instant apps and lighter versions of Google apps, the Bharat Go will come preloaded with apps such as Gmail Go, Maps Go, Files Go, Chrome, YouTube Go, and Google Assistant Go etc. When it comes to the pricing and availability, Micromax has not yet announced anything about it. However, we can expect the Micromax Bharat Go to be priced around Rs. 3,000-4,000 as it was speculated earlier. Along with this smartphone, Google has also showcased the Lava Z50 and it is believed to be launched in March. For more MWC updates, follow the #GTUMWC2018.